Huddersfield Contemporary Music Festival was founded in 1978 and tomorrow, they begin their 2015 festival which will run until 29th November. 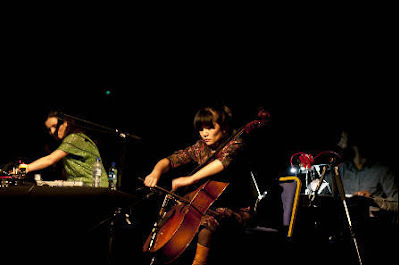 As the UK's largest international festival of new and experimental music, their programme is always packed full of groundbreaking artists and there is always a significant presence of improvised music. There are a few events focused on AMM, the free improv group that was founded in London in the 1960s including a photography exhbition, a talk, a film and a performance by Eddie Prevost's Workshop. The works of Derek Bailey are featured twice; once with his realisation of Stockhausen's Plus-Minus (completed by Simon Fell) and a very large event which will be broadcast on BBC Radio 3 which has a world premiere of Bailey's No. 22 [Ping] and five ensembles playing works by Bailey, Sikorski and Frey. George Lewis will give a talk on composition as ethnography and will premiere his opera Afterword and finally double bassist Dominic Lash will premiere Jakob Ullman's Solo IV. Details of the full programme can be found on the Huddersfield Contemporary Music Festival website.